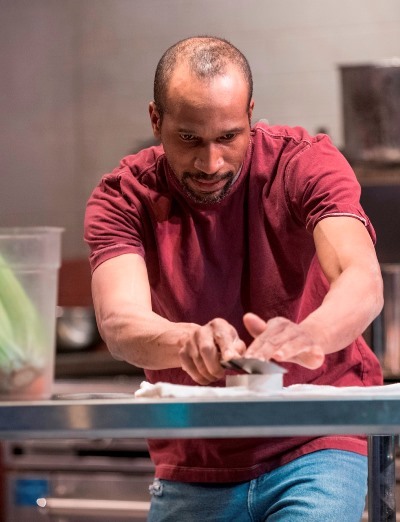 In a different setting, Steve, an anonymous immigrant from Rwanda working as a dishwasher in an ordinary New York eatery, knows well enough how to use a knife. But when a master chef, or what’s left of him after the ravages of alcoholism, takes charge of the kitchen, the quiet dishwasher is drawn out by the elegant appeal of culinary art. 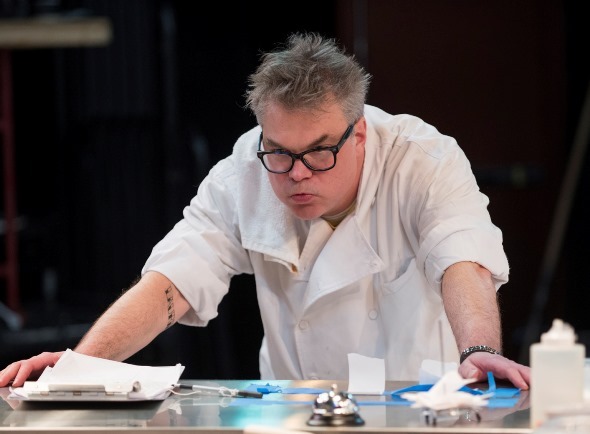 That’s the setup of Will Snider’s wry and unsettling play “How to Use a Knife,” offered in a savory preparation by Shattered Globe Theatre and director Sandy Shinner. “How to Use a Knife” is funny and charming, but it is no sitcom. It is ultimately serious and challenging. And it is very fine. Though several spoons stir this soup, “How to Use a Knife” essentially comes down to a two-hander: Steve, serene and focused in the person of Anthony Irons, and Chef George, acerbic and relentless in the weathered form of Peter DeFaria. Together, the two actors show us two wounded survivors of a harsh world, a dishwasher and a chef who find themselves on common ground, and who make the arduous ascent toward mutual understanding. DeFaria’s cantankerous Chef perhaps qualifies as the lead, with Irons in support. 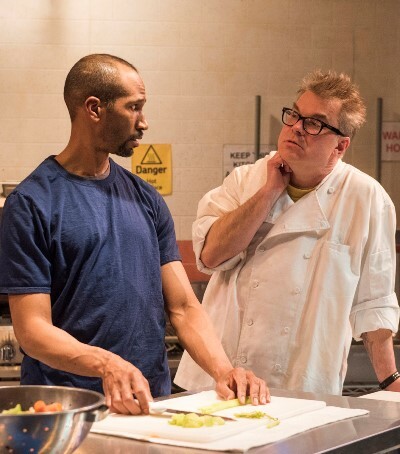 But it’s the calm beauty of Irons’ performance that throws the curmudgeonly Chef into high relief; and although outwardly it is the white Chef teaching this self-effacing and rather mysterious black man from Rwanda, the greater lesson cuts quite the other way. But as it is the Chef’s rough magic that rules here, let the portraiture begin with him. Ha, portrait, indeed. What a visage that would be to frame, DeFaria’s fixed scowl beneath an unkempt graying mane. George is a master of his craft who has played out his options, a proud and meticulous chef undone by booze. He got this job by the grace of the restaurant’s rather flaky owner (Brad Woodard), who goes back a long way with George and knows about his battle with drink; but he needed a chef and decided to give his old pal a chance. 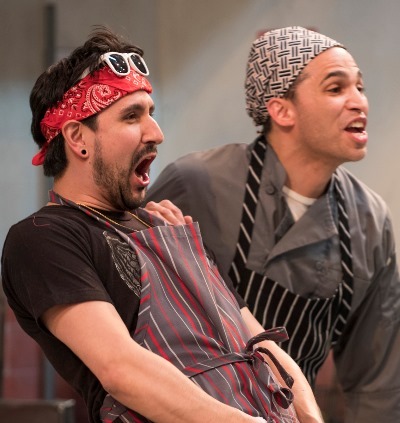 The kitchen cooks are two vivacious Latinos (the disarming pair of Victor Marana and Dennis Garcia), who chatter away in Spanish, and only one of whom appears to speak English at all. The server is a gangly, self-conscious young white guy of dubious competence (Dillon Kelleher). And Steve, who no one’s ever heard speak a word, toils silently over a sink full of suds and dirty dishes. Such is the crew George inherits. (He also gets a very professional looking kitchen, the marvelously elaborated creation of designer Jeffrey Bauer.) The Chef plunges in as if creating haute cuisine in Paris, organizing, commanding, berating. George has three evident modes of speech: grumble, rant, fume – with some emphasis on the last two. When Steve finally speaks, softly correcting someone’s announced assumption that this black man from Africa is Muslim, the whole kitchen falls into an amazed silence. Even George is muted, if only for a moment. But when the volatile Chef pipes up again, it is with great interest in the dishwasher, and with an instinctive respect for his composed, assured demeanor. Steve, who has been attuned to the changing scene behind him, soon confesses a wish to George, whom he addresses strictly as Chef: He wants to learn the art of cooking, properly, from scratch. George takes him seriously. Cooking, he says, begins with broths, and the first step to making a good broth is the proper use of a knife. And correct use of a knife begins with how you hold it. The knife becomes an extension of your arm: You move, the knife moves. The Chef also shows Steve how to sharpen a knife on a stone. The enchanted pupil throws himself into chopping vegetables, making broths, tasting, rejecting, starting over. As the two men get to know each other – and here DeFaria and Irons pull us inside the circle of a welling friendship – George recounts his self-destruction from drinking, as well as a tragedy that scarred his life many years ago. Steve in turn offers George a gift in gratitude for the cooking lessons: the way to inner peace. It is achieved, he explains, through a simple exercise of embracing, then releasing, troubling thoughts as if they were clouds wafting across the mind to be contemplated and allowed to float away. Steve also teaches George to reduce tension by proper breathing. All is good, until all suddenly is not. Steve has omitted some fairly important details about his past, and now it’s hounding him in the form of a U.S. agent on his trail. The rest I probably should move to the back burner to simmer. Except to say that the denouement raises a question that George must grapple with: What is the difference between a man, even one much like himself, and a monster? And in a world that can be cruelly indifferent, if not deeply prejudiced and uncomprehending, who is to render that judgment?